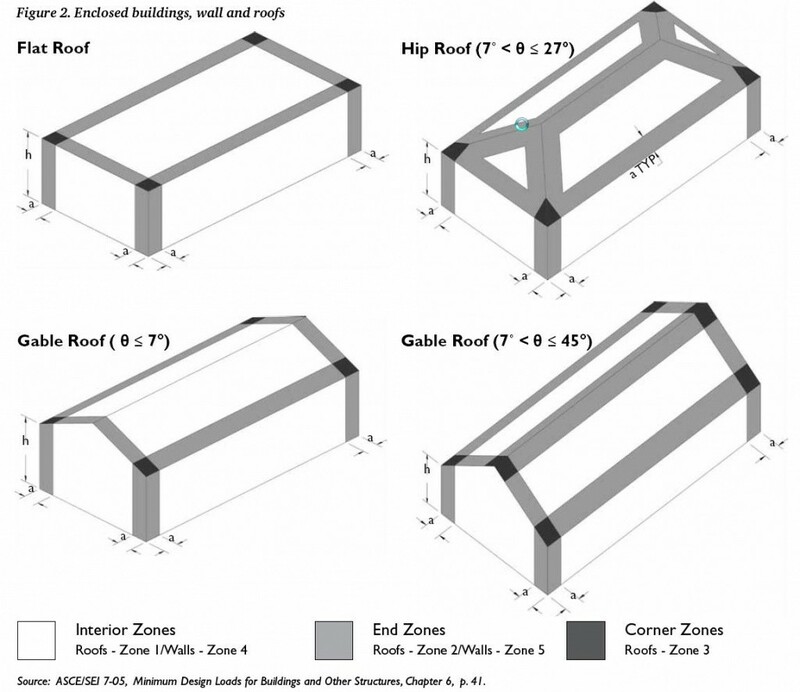 The roof zone describes the amount of wind load that is subjected to the roof. Interior zones, zone 1, have the lowest load and account for about 80% of the roof surface. End zones, zone 2, have a higher load than zone 1. They represent the perimeter of the roof and account for approximately 15% of the roof surface. Corner zones, zone 3, have the highest load. They are located at the corners of the roof and account for 5% of the roof surface. The roof zones come into play when designing how a solar system will attach to the roof. If you have a flat roof and are using a ballasted system in which weight holds the array in place a larger amount of ballast is needed in zones 3 then in zones 1. If too little ballast is used the array can flip or move as it is subjected to strong winds.